SBI Online Specialist Cadre Officer Posts, SBI Officers in Specialised Positions, SBI Specialist cadre officers 2019 Recruitment,Apply online @ bank.sbi/careers/ SBI Specialist Cadre Officer Posts: Recruitment of Specialist Cadre Officers in State Bank of India on Regular and Contract Basis. State Bank of India has issued a recruitment notification and this notification for recruitment of specialist cadre officers in state bank groups. The SBI invites online applications from the eligible and interested Indian citizens in the given following specialist officers posts for wealth management in State Bank of India on regular and contract basis.. In this recruitment candidate can apply for only one post under this project. The process of Registration of application is complete only when fee is deposited with the Bank through On-line mode on or before the last date for fee payment. State Bank of India, SBI has invited candidates to fill up Specialist Cadre Officer posts. Candidates interested for the position can apply for it via the official site of SBI at sbi.co.in. The last date to apply for the post is on March 24, 2019. A total of 08 posts of Specialist cadre officer will be filled up. Faculty, SBIL, Kolkata (Executive Education): Post Graduation in domain relevant to the position. Faculty, SBICB, Hyderabad (Marketing): MBA in relevant area. Faculty, SBICRM, Gurugram, Haryana (Credit/Risk Management/ International Banking): Post Graduation in domain relevant to the position. Marketing Executive SBIL Kolkata: MBA or 2 years Post Graduation Diploma in the discipline of marketing. Chartered Accountants with minimum 2 years experience in statutory/internal/ Concurrent Audit of Banks, in/with a Chartered Accountant firm engaged in statutory/internal/ Concurrent Audit of Banks or in the employment of a Bank. 'Experience Certificate issued by the firms for employees working in CA firms/Copy of the engagement letter from Banks for others, would be required,' reads the official notification, adding that working knowledge in MS office is also required. Selection Process: The selection will be based on shortlisting and interview. Interview: Mere fulfilling minimum qualification and experience will not vest any right in candidate for being called for interview. The Shortlisting Committee constituted by the Bank will decide the shortlisting parameters and thereafter, adequate number of candidates, as decided by the Bank will be shortlisted and called for interview. The decision of the bank to call the candidates for the interview shall be final. No correspondence will be entertained in this regard. Merit List: Merit list for selection will be prepared in descending order on the basis of scores obtained in interview only. In case more than one candidate score the cut-of marks (common marks at cut-of point), such candidates will be ranked according to their age in descending order, in the merit. Candidates should pay Rs. 600/- for General and OBC candidates & Rs. 100/- for SC/ ST/ PWD candidates through online payment gateway by using debit card/ credit card/ Internet Banking etc. 6. Others (PWD certificate, form-16 as on 31.03.2018, current salary slip etc. Application fees and Intimation Charges (non-refundable) is Rs 600 for general and OBC candidates and intimation charge of Rs 100 for SC/ ST/PWD candidates. SBI SCO application process upto February 11: TState Bank of India has invited applications online from interested and eligible candidates for appointment in the Specialist Cadre Officer posts on contract basis. Candidates can apply on-line through the Bank's website https://bank.sbi/careers or https://www.sbi.co.in/careers. The online registration of application & payment of fee can be done online till February 11, 2019. Before applying for a post, the candidates should ensure that he/ she fulfills the eligibility and other norms for these posts. SBI SCO application process begins from November 22: State Bank of India invited applications online from interested and eligible candidates for appointment in the Specialist Cadre Officer posts on contract basis. Candidates can apply on-line through the Bank's website https://bank.sbi/careers or https://www.sbi.co.in/careers. The online registration of application & payment of fee can be done online from November 22 to December 6, 2018. Before applying for a post, the candidates should ensure that he/ she fulfills the eligibility and other norms for these posts. Online Registration of Application & Payment of Fees: from 22.11.2018 TO 06.12.2018. 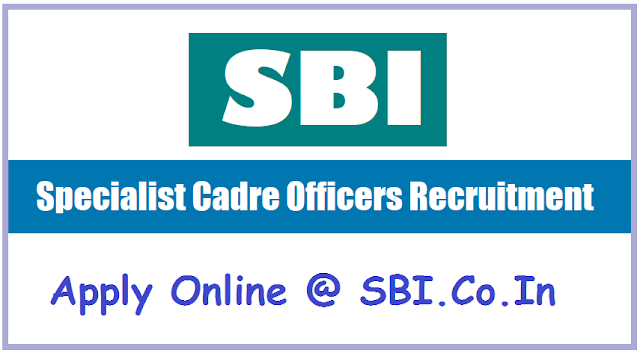 SBI Specialist Cadre Officers: State Bank of India has invited applications for recruitment of 47 specialist cadre officers.The registration process of the recruitment starts on October 30, 2018 and closes on November 22, 2018. Candidates can apply for one post only from among the various positions announced. The advertisement available on the state-run bank’s official website sbi.co.in shows 47 vacancies for four posts namely analytics translators, sector credit specialists, portfolio management specialists and sector risk specialists. Online Registration of Application & Payment of Fees: from 30.10.2018 TO 22.11.2018. SBI Specialist Cadre Officers: State Bank of India (SBI) has notified Specialist cadre officer recruitment for a total of 48 vacancies out of which 21 are contractual in nature. Candidates will be selected on the basis of shortlisting and interview. Graduates in the relevant field having required years of work experience are eligible to apply for the posts. Online registration will begin on September 7 and interested candidates can apply before September 24. Candidates shall have to apply online at the official websites bank.sbi/careers or sbi.co.in/careers.